The Angel storyline is continuing, despite leaving us at a good stopping point last season and having Faith show up in the Buffy comic. It leads me to wonder if both comics aren’t being harmed by the enforced separation. I seriously thought that the two comics would be combined after last year, at least for a while. We came to a great end point for Angel’s immediate journey, Faith got a chance to go off and regroup, and Giles was learning how to be Mini!Giles. 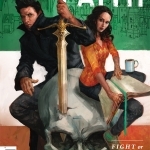 And when the new season of the Buffy comic started, Faith and Giles were even present there, so why then are the two worlds again being forced apart, but not really? I think it’s detrimental to continue in this manner, unless something massive is going to bring Faith back into Angel’s world. Until then, I remain unconvinced. With Faith and Giles out of his life for the moment, Angel has been patrolling the streets and back alleyways alone in Magic Town. He’s doing this, mainly, because he feels responsible for the state these people are in. There’s that eternal guilt we’re so used to! And like the hero he feels he is, when a flying pack of pixies attacks a young man, Angel is there to save the day. Well, maybe. It’s not like the victim, Andy, is so keen on being thankful. Instead, he’s afraid of interacting with Angel, running off and proclaiming that “she” told them not to talk to the vampire. Hmm, a mystery. Who is this “she”? Sounds like something that could carry us through multiple issues, as we search out the figure who is controlling things behind the scenes. Well, it sounded good. But instead, the storyline gives us a rapid montage of “Angel searches, Angel meets dead ends, Angel maybe gets a lead” after he comes home to find Andy strung up in Angel’s apartment, with a warning written across the wall in blood. What Angel wasn’t privy to, but we were, is that Andy was working for the pixies, perhaps being strong-armed by them, to provide magic? I think that’s what he had in the jar, but I’m not sure. Whatever it was, we get the gist. Pixies are mobsters, they are bad news, don’t cross the pixies. So, maybe the fight against the little monsters are what will carry this storyline and not the revelation of “she” because that comes at the end of the first issue. It’s someone who has magic running through her and is determined to help Angel get back on the right track. Whether that’s a good thing or not, we’ve yet to find out. Meanwhile, there’s Faith and Mini!Giles, who we know from the Buffy comic are over there helping the Slayer with her zompire problem. Only, we had to back up and then revisit the storyline because apparently some readers aren’t up to speed on the other comic. Really? That’s necessary? To me, it just feels like sloppy story-telling and improper pacing. 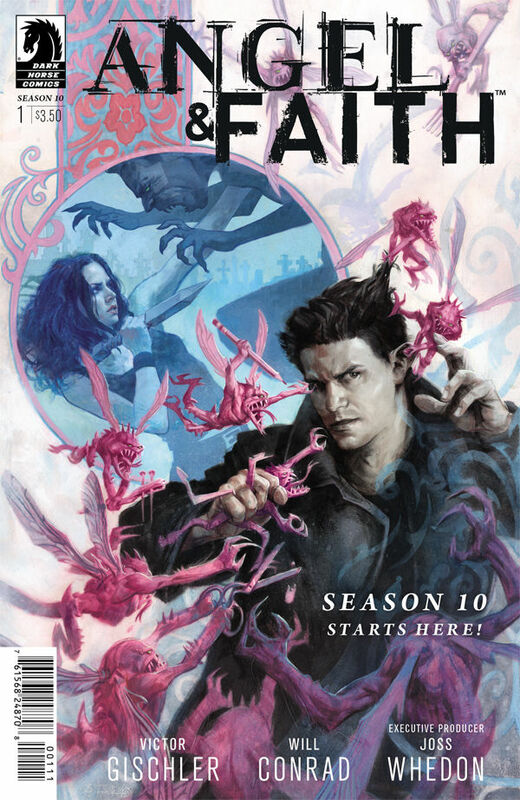 All we really learn from the walk down the same road is that Koh is working with Buffy, which we could have found out in that comic, and that Faith has mixed feelings about where she fits into the world now, again something we could have found out in the other comic. I think Faith’s going to leave Mini!Giles with Buffy, go work with Kennedy at Deepscan, and then get back into the Angel storyline. With all the bouncing back and forth between Angel and Faith, it was hard to get clarity on much of anything. The only clear message I got was “maybe these two worlds don’t need to be split anymore.” But, whatever sells comics.